Begin with chain 5 and join to from a ring. ch 2, 3 tr, 4 dc, 1 tr, 4 dc, 3 tr into the ring, ch 2, sl st into the ring. Round 2: sc into the top of the ch 2 stitches, 2 dc in next st, 3 dc in next st, 2 dc in next st, dc in next 3 st, 2 dc in next st, (1 dc, 1 tr, 1 dc) in next st (which is the bottom tr of the first round), 2 dc in next st, dc in next 3 st, 2 dc in next st, 3 dc in next st, 2 dc in next st, sc into the top of the ch 2 stitches, sl st into the first sc. Round 3: 2 dc in next st, (1 dc in next st, 2 dc in next stitch) 3 times, dc in next 6 st, (1 dc, 1 tr, 1 dc) in next st (which is the bottom tr of the 2nd round), dc in next 6 st, (2 dc in next st, 1 dc in next st) 3 times, 2 dc in next st, join with sl stitch into sc. Weave in ends. NOTE -- because this heart is so big, it's not really suitable for hanging from the center of the top because it won't hold its shape. I think you can hang it from two points, one on each side of the top. NICE! Thanks for writing up the pattern, Betty! I'm definitely making a few of these! The hearts I made left a hole in the middle, so I sewed up the hole the best that I could with the tail from the beginning chain. Did you have this problem? If so, how did you fix it? 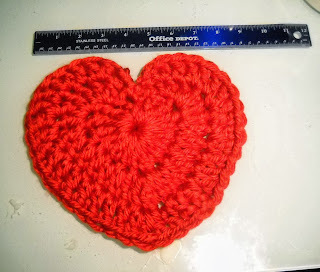 If you'll notice, my crochet heart actually does have a hole in the middle, and I left it that way because it didn't bother me.